These are the mountains that lie between Salida, Aspen, and Vail, Colorado, near Stages 1-3 of the USA Pro Cycling Challenge. There are 53 mountains in Colorado over 14,000 feet in height. Read more about what makes hiking so popular in this state at 14ers.com and Fourteeners.org. 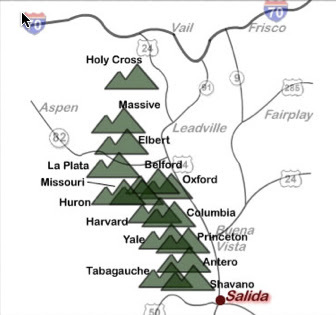 Most of the 14ers in Colorado are accessible by foot, a few have roads to the top including Pikes Peak (near Colorado Springs) and Mount Evans (near Idaho Springs).